Mark Batterson is the lead pastor of Washington D.C.’s National Community Church, widely recognized as one of America’s most innovative churches. Mark is the author of the bestselling In a Pit with a Lion on a Snowy Day and a widely read blogger. He lives on Capitol Hill with his wife, Lora, and their three children. 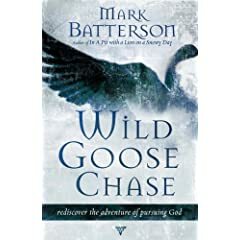 In Wild Goose Chase, Batterson has created an excellent text seeking to inspire the reader to step into the adventure of chasing the Wild Goose. The main thrust of the book is to address cages that we find ourselves in that prevent us from chasing the Holy Spirit and God’s dream for our lives. Batterson covers the cages of: responsibility, routine, assumptions, guilt, failure and fear. Batterson assesses each of these with a refreshing mix of biblical narrative, personal experience, perspectives from church history, and stories from National Community Church. Each chapter closes with hope, next steps and probing questions for self-reflection. I thoroughly enjoyed Wild Goose Chase, finding it inspiring and encouraging. Batterson writes well and uses solid examples from both inside and outside the church world. I was struck by Batterson’s use of scripture throughout the book – both in narrative examples and subtle endnoted references. This technique was quite effective and it reminded me of the style of some of John Wesley’s writing. Wild Goose Chase will be released on August 19 and you can pre-order a copy from Amazon here or find out more about the book including a free download, preview chapter and Mark’s 10 Steps to Setting Life Goals at chasethegoose.com. I will go back to Wild Goose Chase in the future and I heartily recommend it to those seeking to find or rediscover the adventure of pursuing God’s dream.